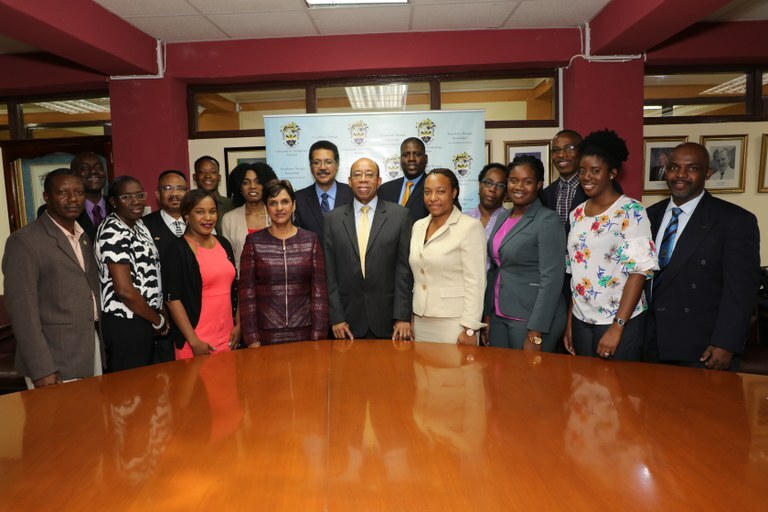 11 UTech, Jamaica Students Receive PetroCaribe Scholarships — UTech, Ja. Scholarship awardees and leadership from UTech, Jamaica, PetroCaribe Development Fund and the Ministry of Finance and the Public Service pose for a group photograph: From left (front row) Frederick Mills, Lecturer, Joan Duncan School of Entrepreneurship, Ethics and Leadership, (JDSEEL) Pauline Madourie, Scholarship Office, UTech, Ja., Michael Steele, Head, JDSEEL, Kadie Mundell, student, JDSEEL, Dr. Ruth Potopsingh, Associate Vice President, Sustainable, Energy, UTech, Ja, Dr. Wesley Hughes, CEO, PetroCaribe Development Fund, Mrs. Kelli-Ann Garricks, Director, Scholarships and Assistant Unit, Ministry of Finance and The Public Service, Kimberly Powell, and Zuri Scott-Garricks, students, MSc in Sustainable Energy and Climate Change and Barry Thomas, Assistant Registrar (Acting), UTech, Ja. Second row from left are Rohan Brown and Roberto Ellis, students, MSc in Sustainable Energy and Climate Change, Shantel Robinson, BSc in Entrepreneurship, Professor Stephen Vasciannie, CD, President, Richard Lawrence, students, MSc in Sustainable Energy and Climate Change, Winifred Henry, Scholarship Assistant, Ministry of Finance and The Public Service and Dr. Garfield Young, Dean, Faculty of The Built Environment. Eleven students from the University of Technology, Jamaica (UTech, Ja.) have been awarded scholarships from the Ministry of Finance and The Public Service under the Tertiary Scholarship Programme sponsored by the PetroCaribe Development Fund (PCDF). The scholarships were presented by Chief Executive Officer, PCDF, Dr. Wesley Hughes at a presentation ceremony held at the University’s Papine Campus on Wednesday, February 21, 2018. The scholarships valued at $ 2.9 Million were awarded to seven (7) students enrolled in the MSc in Sustainable Energy and Climate Change programme. They are; Richard Lawrence, Roberto Ellis, Rohan Brown, Damion Burton, Zuri Scott-Garricks, Kimberly Powell and Danae Vaccianna, and four (4) students enrolled in the BSc in Entrepreneurship course of study - Kadie Mundell, Yanique Williamson, Shantel Robinson and Krystal Brown. PetroCaribe, launched in 2005, is an oil alliance of many Caribbean states with Venezuela to purchase oil on conditions of preferential payment. In December 2006, the Government of Jamaica created the PetroCaribe Development Fund to manage the proceeds which accrued to Jamaica under the PetroCaribe Energy Cooperation Agreement. As part of this Agreement, the Government of Venezuela agreed to convert a portion of each payment due for petroleum products supplied to PetroJam Limited into a long term concessionary loan. Dr. Hughes in noting that “the handover of the scholarships fit very well into the mandate of the Fund,” explained that the PCDF also operates a grant facility through which investments are made in projects and programmes which benefit the most vulnerable in the society and their communities. Resources for this aspect of its operations flow from the surplus generated by its loan financing and investing activities. Mrs. Kelli-Ann Garricks, Director, Scholarships and Assistant Unit, Ministry of Finance and The Public Service said that the Ministry has aligned itself to programmes that support key industry areas that will advance Jamaica’s Vision 2030 national development plan. She pointed out that the scholarship programme with PetroCaribe focuses on entrepreneurship, logistics, energy and Spanish. Mrs. Garricks said that the Ministry was therefore pleased to partner with the Joan Duncan School of Entrepreneurship, Ethics and Leadership (JDSEEL) led by Mr Michael Steele, Head of School and the University’s Caribbean Sustainable Energy and Innovation Institute (CSEII) headed by Dr. Ruth Potopsingh, Associate Vice President, Sustainable Energy who conceptualized the Master of Science Degree in Sustainable Energy (MSSECC) and Climate Change which was launched in March 2017 with the first cohort. MSSECC student, Mr. Richard Lawrence and BSc. Entrepreneurship student, Miss Kadie Mundell expressed appreciation on behalf of their fellow awardees to PetroCaribe, the Ministry and the University of Technology, Jamaica.